The Pacific Television Theater (or Pacific TV) is a live televised anthology show that is being produced at and broadcast from Community Television of Santa Cruz. Pacific Television Theater broadcasts on on Comcast 27, Charter 73, and will live webcast over http://www.communitytv.org/watch/ctv-public-access-2773/. Left to right: Susy Parker and Joe Milo from What’s Hiding in Your Tree?, and Nicolette Nasr and Shaun Carroll from I Can Quit Anytime. Episode 6 was a pair of short plays: I Can Quit Anytime, a look at Facebook addiction, and What’s Hiding In Your Tree?, a fictitious ancestry show. The live broadcast was on March 14th, 2019. This is an edited version of the live broadcast. Episode 5 was a pair of staged readings of two works in progress, performed on July 7, 2018. Episode 4, Oasis, was performed and live broadcast on May 27, 2017. 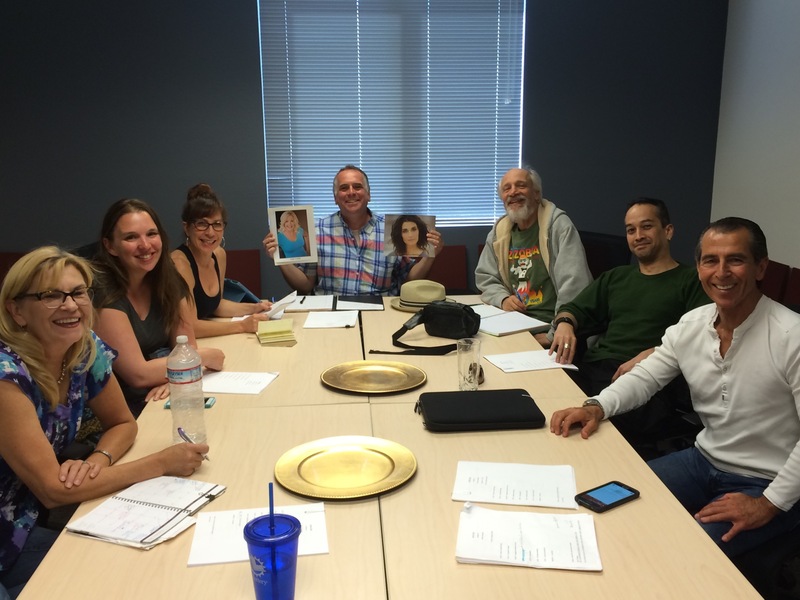 Below is a picture from the read through on Saturday September 17. And our first show premiered on June 25, 2016. The cast of Gateway/Reunion after a rehearsal. Gateway is about a new resident at a gated community who soon discovers that the troubles he thought he’d be leaving behind in the outside world mat also exist within the seemingly secure confines of the gated community. Reunion is about two old high school classmates who run into each other after twenty years, and have two very different memories of the past. From left to write; me, Steve Capasso, Jackson Wolffe, Marty Lee Jones, Tiffany Cesi, Cesarin, David Leach, Hannah Eckstein, Seth Vernon, and Nicolette Nasr. The first play, Last Call, is a one act that takes place in a neighborhood pub on a slow Tuesday night. It is an ensemble piece that follows of lives of its various patrons as they pursue what they want in a world that always isn’t giving. Our read through, which was on May 22nd. From left to right is Ana Paula Santee, Hilary Davidson, Benjamin Pletcher, myself (writer and director), Rick Kuhn, Jackson Wolffe, and Seth Vernon. Hilary Davidson as Celia and Benjamin Pletcher as Jerry, a couple whose relationship is on the rocks, from rehearsal on June 5th. The control room at the new Santa Cruz Community TV studio, at the controls is technical director David Goldman. Pacific Television Theater was inspired by the Golden Age of Television. An era from the early days of the medium when live broadcast anthology shows featured many up and coming actors, brilliant writers and directors, and presented some of the finest drama of its day. I am attempting to recapture the magic of that time while bringing it into the modern era. Also, by presenting this play live instead of recording it so it can be watched at people’s leisure, it specifies a time and place when people can all get together for a single shared experience, a perfect pairing of art and technology!